But as residents of hard hit states like New York and New Jersey set about putting their lives back together in the storm’s aftermath, political observers noted—distasteful as it was so soon after—that Hurricane Sandy may have been boosting President Obama’s reelection hopes. Bipartisan cooperation in the storm’s aftermath, highlighted by Obama and Christie working together to ensure an effective federal response, earned the President high praise. According to Pew, 67 percent of registered voters approved of Obama’s Hurricane response, with just 15 percent disapproving. National polls taken after the storm show Obama with a measurable, though very slight, lead over Romney heading into Tuesday’s election. Come hell or high water, the election is happening. And with one day to go, even the most devastated states feel ready. Below is a look at how the affected states, some with the help of the federal government, are working to enable voter turnout. Polling stations moved. 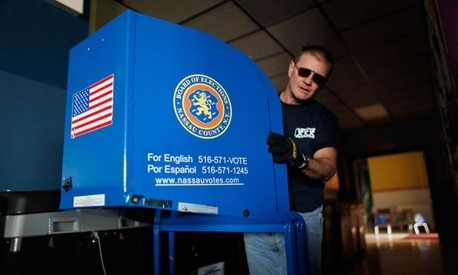 NBC Connecticut reports that all but two of the state’s 773 polling stations have had power restored. The two polling without power have been moved to nearby schools. Voting by fax and email. According to a directive from Republican Secretary of State and Lt. Gov. Kim Guadagno, any voter displaced by Hurricane Sandy will now be designated an “overseas voter.” This allows displaced residents to apply for a ballot with their county clerk, print it and send back a scanned or faxed copy. Critics worry this solution may not help those hardest hit by the storm who lack access to the Internet or a scanner. Early voting extended. Christie has also ordered all polling stations to remain open over the weekend. Unlike New York, New Jersey allows early voting. Remaining Power Outages: According to the U.S. Energy Department, approximately 780,000 residents in New Jersey remain without power. Polling stations moved. The New York City Board of Elections has made changes to 66 sites, the majority of which are in the Queens and Brooklyn areas. For information on changes, voters are encouraged to call a statewide phone number at 1-855-NYS-SANDY. Extra day of voting. Voters may get an additional day to cast a ballot if the aftereffects of the storm are so severe as to depress turnout below 25 percent. In that event, counties may file a request with the State Board of Elections and, should it be approved, a second day of voting will be scheduled, in accordance with an old New York law, within 20 days of Nov. 6. Remaining Power Outages: According to the U.S. Energy Department, approximately 500,000 in New York remain without power. What are other unique ways are states adjusting to the storm damage? Share in the comments. Previous Post | Infographic: Who Actually Votes in America? Next Post | Would an Obama Win Make Mitch McConnell a Failure?